Looking back at the mobility sector over 2018, Gary Braithwaite, Director of Bayliss Mobility, makes some informed predictions about 2019, including the need for public-private cooperation, the shifting retail landscape and a lucrative, growing demand in mobility scooter accessories. In 2018, innovation and increased funding from governments internationally drove growth in the mobility scooter market. As people continue to live longer, the mobility and disability aids sector continues to grow. If a business can latch onto a useful trend, they’re onto a profit-winner, making this is an area of high research and consistent innovation. In the UK specifically, however, the Red Cross estimated that around four million people in need of a wheelchair or similar could not get access to an adequate mobility aid. Mike Adamson, the chief executive of the British Red Cross, told the Guardian in July of the basic failures meted out across the country at large. “Every day we see the huge impact something as simple as a wheelchair can make to someone suffering with a broken limb, recovering from surgery or even during end of life care,” he said. This is largely down to NHS funding cuts and a general over-reliance on private enterprise and subcontracted services that are not well organised enough to meet the sizeable demand in front of them. Massively increased public-private cooperation or a revolution in social care is needed for significant change. As it stands, the UK is also set to leave the EU at the end of March 2019, and with this move comes a great deal of uncertainty across industries. Regardless of how state-funded organisations deal with this monumental shift, private companies will have to be on hand to pick up the pieces and address any shortfalls in required resources for the communities that they serve. This all seems to point towards the onus being on the retail sector to take ownership and provide the essential services for those with mobility needs, rather than social care, which is currently failing the population at large. Although we have seen new brick-and-mortar mobility shops opening, this should be seen as bucking the trend, rather than setting a precedent. There is a demand for physical shopping spaces, but it is also very difficult to keep a physical shop funded and open. 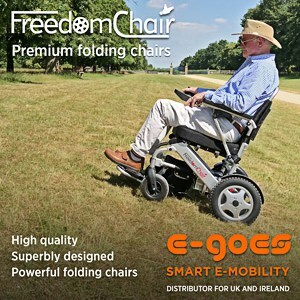 Online retailers must take the lead when it comes to mobility aids and products for elderly and vulnerable people. They must rise to the challenge by ensuring their systems are accessible to all users. When Shopmobility closures force vulnerable service users online, the local community needs to adjust as quickly and with as little hassle as possible. With many people requiring these services less internet-savvy than most, online businesses must ensure that their services are easy to access. Even something as simple as an intuitive page layout or larger text size might make the difference between a vulnerable person purchasing the right piece of life-enhancing technology and them feeling that the product that they need is not available anywhere. Further to this, the discrepancies in what is available to the same demographic in different parts of the country mean that local spheres of influence will continue to dominate in 2019. If you are deemed to be at risk of falls at home and you live in the Liverpool City Council region, for example, you are eligible for a free telecare package, complete with a fall detector. This service would cost many hundreds of pounds per year in other parts of the country. This particular imbalance has already seen private local telecare provider VNC Lifeline go into liquidation, as the services it provides are now available free of charge. Businesses that provide services that could otherwise be delivered by the public sector should consider diversifying their product ranges to defend themselves against a decision made at a local government level that could put them at risk. When there is a deficit in local services, however, we tend to see an increase in demand from the public in places like online shops, charities and advice centres, such as Citizens Advice. The latest offers, upgrades and adjustments for mobility scooters are typically discussed among service users in a central hub — whether that’s a Shopmobility store in the town or a local community group. Now, with such spaces becoming less prevalent, that conversation needs to move online. In terms of sales within the industry, the trend that may well grow most in 2019 is the ongoing upturn in interest in accessories for mobility scooters that serve a practical purpose. As people begin to rely more and more on their mobility aids, fitting them with all of the handy solutions to daily life’s problems becomes more important. Storage compartments, alarms and visibility accessories will continue to rise in demand, and the scooters themselves that are fitted with the most adaptations as standard will see the most success in this ever-growing market. Gary Braithwaite is the Director of Bayliss Mobility. With over 25 years’ experience in the mobility industry, Gary prides himself on making sure all his customers’ needs are met while delivering quality products that help people regain and retain their independence.